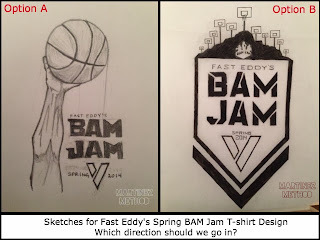 BAM JAM 3 on 3 Basketball: Which design direction do you want on this spring's shirt? Which design direction do you want on this spring's shirt? 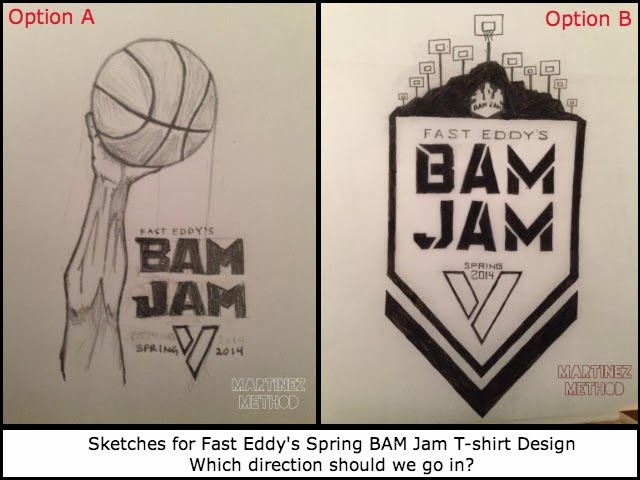 Fast Eddy's Spring BAM Jam wants to give you the chance to vote on which direction you would like us to go for this spring's t-shirts. For the last 5 years, Jason Martinez and The Martinez Method, has designed our shirts for the spring and summer tournaments, including the participant shirts and the champion's shirts. It isn't easy coming up with new ideas every year but he always comes through. For this spring, here are the two directions that we can go and we want you to pick. Vote each day through Sunday, March 2 at 5:00 PM Mountain Time. From there we will take the winner and create the final version of this spring's shirt. Keep in mind that these are just sketches. The final creation will be a crisp two color version laid out on an actual shirt. Click on an image to enlarge. In which design direction should we go for the Fast Eddy's Spring T-shirt?